In Part One, we saw that Jesus is the Interceding Sovereign of the universe. Seated at the throne, ruling the universe, He lives to make intercession for us. Today we see that we join Him in this rule—that through prayer we reign with Him. 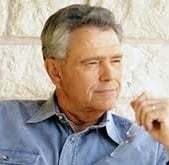 This article is based on a chapter in Mighty Prevailing Prayer by Wesley Duewel. I highly recommend you get a copy! Mine is highlighted and bookmarked throughout. It’s an invaluable resource and encouragement in prayer. 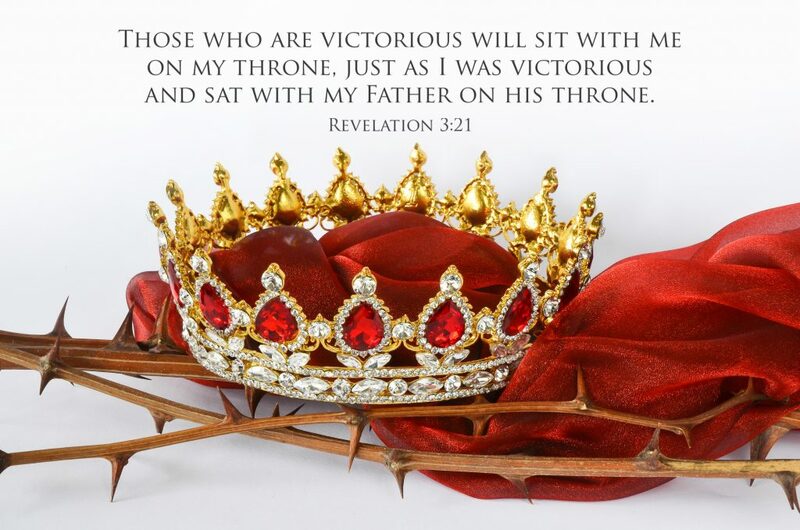 “Those who are victorious will sit with me on my throne, just as I was victorious and sat with my Father on his throne” (Revelation 3:21, NLT). 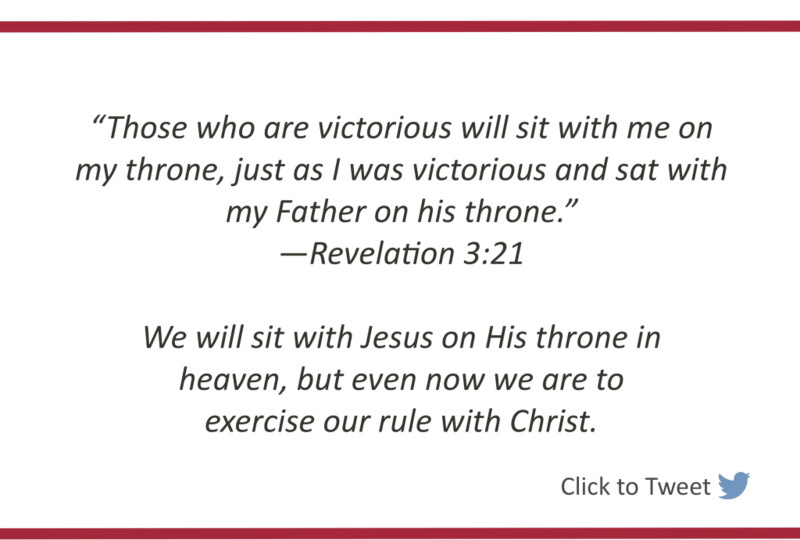 We will sit with Jesus on His throne when we are in heaven, after the judgment seat of Christ, when He gives to us His rewards. But even now we are to exercise our rule with Christ. “To Him [Christ] who loved us and washed us from our sins in His own blood, and has made us kings and priests to His God and Father…. (Revelation 1:5-6, NKJV). “[You] have redeemed us to God by Your blood … and have made us kings and priests to our God…” (Revelation 5:9-10, NKJV). We participate in this dual ministry of Christ. As kings, we rule with Him. As priests, we share His ministry of prayer and intercession. We cannot separate these two functions. If we are to rule as kings, we must serve as priests. Through God’s grace and our faith, we can appropriate and experience Christ’s death, resurrection, and exaltation. We can know what it is to be crucified with Christ (Gal. 2:20), to be raised with Christ (Eph. 2:6), and to be seated with Christ who is on His throne. When does our reign occur? In the present life, or the life to come? Life in fellowship with Christ means that we share His sovereign power. Our reign will reach its fullness in heaven, but we reign with Christ now through prayer, just as Jesus is reigning by prayer. God “has blessed us in Christ with every spiritual blessing in the heavenly places” (Eph. 1:3, ESV). We are members of Christ’s body, with Jesus being the head. Figuratively, we are part of His body. Therefore, whatever takes place with Jesus takes place spiritually with us. He is the vine, we are the branches (Jn. 15:5). We are in Him and He is in us (1 Jn. 4:13). We are in Christ. Therefore, we are one with Him in His death on the cross, one with Him in His resurrection, and one with Him on His throne. Reigning on the throne with Christ is as real as our crucifixion with Him. Our position with Christ on His throne is supposed to produce as clear and life-changing of results as our crucifixion does. We are embodied in Christ, so therefore we sit beside Him on His throne of intercessory dominion. You and I are already exalted to the throne where Jesus reigns. We still dwell on earth, but our spirit is in the heavenly realm with Jesus. We are in the world, but not of it (Jn. 17:11,14). We have been raised in spirit above the earth and all that is temporal. You are spiritually to share Christ’s exaltation now. You are to participate in a throne life and role now. You will possess in heaven visibly only what you possess now spiritually. Since all things are under Christ’s feet (Eph. 1:22) and you are “in Christ,” then all things are potentially under your feet also. Paul assured the believers in Rome, “The God of peace will soon crush Satan under your feet” (Rom. 16:20). Is not this what Jesus referred to when He said, “I have given you authority to trample on snakes and scorpions and to overcome all the power of the enemy” (Luke 10:19)? This conquest must be accomplished through prevailing intercession. Then you realize the power to crush Satan. By faith, in virtue of Christ’s cross and in His name, you can even issue commands to Satan. From your position where you are seated with Christ on the throne, you look down in spiritual vision upon Satan…. This truth is so incredible that Paul was concerned we would not grasp it. So before he explained it to the Ephesians, he continually asked God the Father to give them “the Spirit of wisdom and revelation,” enlightening the eyes of their heart so they could understand and grasp the wealth of riches they (and we) have in Christ. This wealth we have is His “incomparably great power for us who believe” (Eph. 1:19). Paul describes how that same power—the power in which we share—raised Christ to the throne in heaven and put everything under His feet. Paul then says that we are there seated there with Christ (Eph. 1:17-2:6). May God help us comprehend the power and authority that have been given to us through prayer! This truth is the basis for prevailing prayer. And it explains why, through prayer, we can chase, attack and defeat Satan. In our flesh, we are weak. We can do nothing. But in the Spirit, we are seated with Christ in the heavenlies. There, He has delegated to us the privilege of praying in His name, resisting Satan, our already-defeated foe, and crushing Satan under our feet because Satan is under Jesus’ feet. We must remember that throne life is not something we achieve by our own efforts or merits. It has been given to us by God’s grace. If we wrestle and feel effort in prayer, it’s not because we are struggling to attain a position at the throne. It’s because it is a consequence of exerting our authority in prayer, not the way by which we attain it. You do not work up to this throne life little by little. it is not by your struggling, praying, and fasting that you finally attain throne life. Throne life is God’s gift of grace to you in Christ. Having realized God’s gift of throne life, you may at times wrestle and fast as you prevail in prayer. But it is the expression of throne life, not a means to enter into it…. Prayer is the highest proof that we are created in the likeness of Christ. Let those words sink in. You and I can actually enter the mind of the God of the universe, assert His power, and bring down to earth what would not have otherwise been given, if not for prayer—provided, of course, that our wills are subject to His. Because of Christ’s sacrifice, you and I have been found worthy of entering into communion with Him. The activity of this communion includes becoming the means through which God fulfills His eternal purpose. In other words, God can achieve His will for the universe through us. He has chosen to exert His rule through us lowly, fallen, redeemed human beings. This is mind-blowing! God has chosen to exert His rule through us! Oh the riches that we squander daily! … and we throw it all away because we refuse to pray! We refuse to take up our role on the throne with Christ and exert His authority through prayer! As we saw in Part One, intercession is God’s only channel of blessing. Whether in heaven or on earth, every blessing God gives is the result of intercession. Sadly, we deny ourselves and the world the benefit of these blessings because we’re too lazy … too busy … too preoccupied … too idolatrous to pray! We fail to exercise our kingly dominion through our priestly ministry of prayer. Exercising our “throne authority” should be a part of our every day life. It’s not something we utilize on rare occasions. You and I are supposed to confront Satan from Christ’s throne. If we only we understood the power and authority we’ve been given. If only we realized that Satan is under our feet—that through Christ we have authority on the throne to overcome all the power of the enemy (Luke 10:19). If only we fully grasped the power we have—that Christ is the head of every power and authority, and in Christ, we share that power—we would stop cowering in the dust before the devil! In order to actualize our reign with Jesus on His throne, we must live surrendered, consecrated, and filled with the Holy Spirit. Enthroned prayer warriors have power with God in the secret place of prayer. They exercise their authority humbly, but readily. They are sensitive to the Holy Spirit. They feel His heart, share His concerns, and wield their authority for His ends and purposes. Because of their quiet submission and consecration and their committed life of prayer, God’s presence rests on them. They exude His love, joy, peace, patience, kindness, goodness, and faith. sharing Christ’s throne as a priest unto God (1 Peter 2:9). All authority in heaven and on earth has been given to Jesus (Matt. 28:18). Because of Jesus’ authority, we can pray in His name and are assured of God’s answer. Praying in Jesus’ name means that we pray in His stead. We pray as He would pray if He were in our shoes. As we abide in Christ and let His words abide in us (Jn. 15:7), we come to know His will, and we can pray as He would. We declare what He would declare, bind what He would bind, and loose what He would loose if He were in our position. see broken families reunited ..
Are you ready to do all this and more through prayer?! Will you take up your role on the throne with Christ and exert His authority through intercession?! The video below is live from People & Songs. It’s not professionally produced, so you may have to crank the volume up to hear all the words clearly, but it’s worth it. I can’t believe how perfectly it ‘echoes’ this post! I only heard it for the first time yesterday… loved it and thought it would be great to use at some point. It was still open on my computer today when I began looking for a music video—and I about hit the floor when I heard it in today’s context. It’s perfect for the message the Holy Spirit is conveying to us today. I love how He works! Jesus, You have given us power and the keys of the kingdom to do the same as You. You’ve seated us on the throne with You and made royalty out of us slaves. You’ve crushed the darkness and You’ll continue to crush it through us—even today through our prayers and our worship. We proclaim in Your name that walls are falling down! Strongholds are breaking! Breakthroughs are coming! Miracles are occurring! In Your mighty, chain-breaking name, we echo your authority! 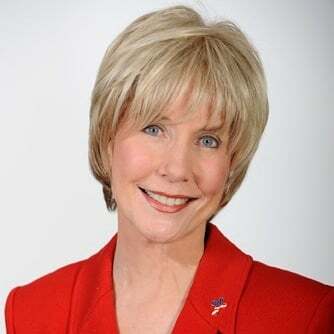 We echo your victory! Have you ever given much thought to your position with Christ—that you are embodied in Him and sit beside Him on His throne of intercessory dominion? Is this a fact that has influenced your daily life and your priorities? 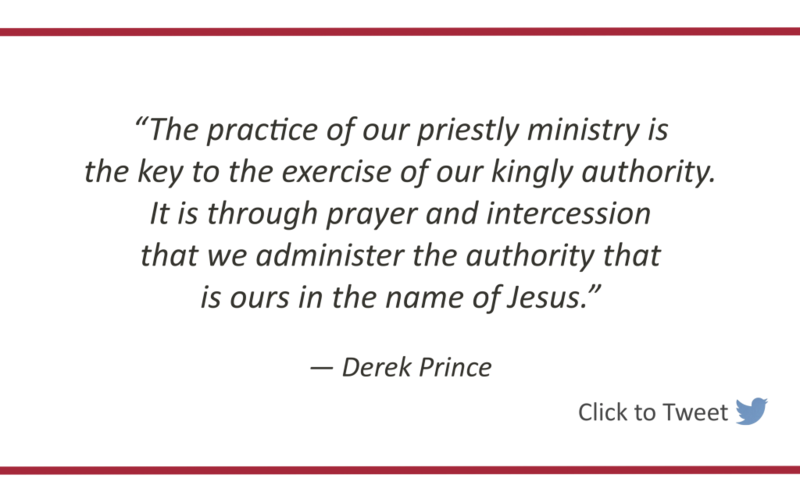 Will you daily, continually, exercise your kingly authority through your priestly ministry of prayer? Will you commit to pray—to enter the mind of God, assert His power, and bring down to earth what He otherwise would have not given? 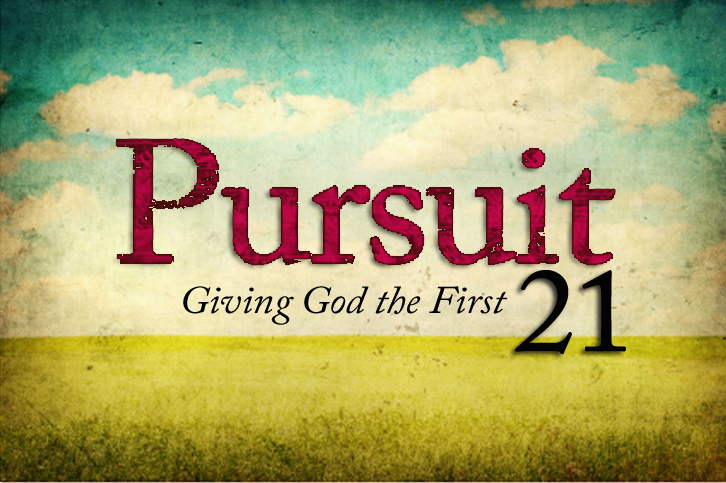 Are you willing to do what it takes in prayer to become the channel through which God can fulfill His eternal purpose? Do you realize that in Christ’s name you can issue commands to Satan? Are you exercising the power you have in Christ to crush Satan? Most days do you feel like you’re cowering in the dust before Satan and his demons? Christ is the head of every power and authority, and in Christ, you share that power! All things are under Christ’s feet. You are “in Christ,” so all things, even Satan and his demons, are potentially under your feet also. Will you make prayer your priority, and let the Spirit empower you to pray flaming lightning bolts from the throne? Derek Prince, Shaping History Through Prayer and Fasting (New Kensington, PA: Whitaker House, 2002), p. 44. 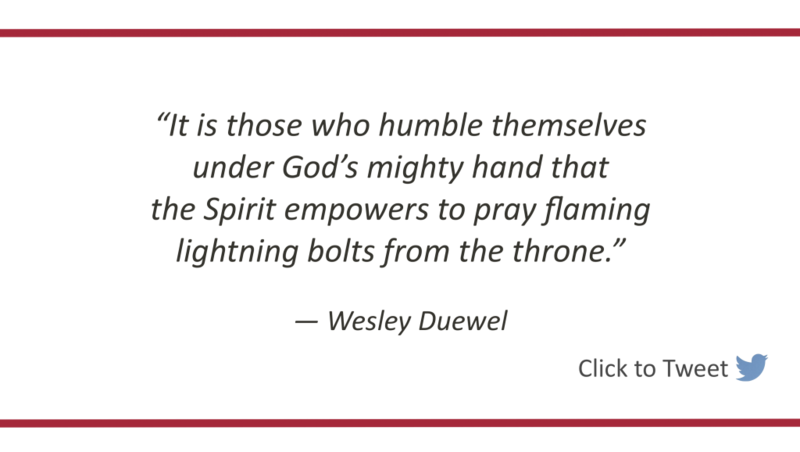 Wesley Duewel, Mighty Prevailing Prayer: Experiencing the Power of Answered Prayer (Grand Rapids, MI: Zondervan, 1990), p. 47-48. Kindle edition. Andrew Murray, The Ministry of Intercession. In Andrew Murray on Prayer (New Kensington, PA: Whitaker House, 1998), p. 465. Mighty Prevailing Prayer, p. 55.